Regent's Associate of Science in Health Sciences, offered on campus in Virginia Beach, provides a challenging general-education curriculum integrated with a specialized focus on science. Study subjects including ethics, anatomy, physiology, nutrition, microbiology and chemistry—all taught from a Christian worldview. Take a significant step toward earning your bachelor’s degree upon completion of this health sciences major. Take the next step toward earning your bachelor's degree. 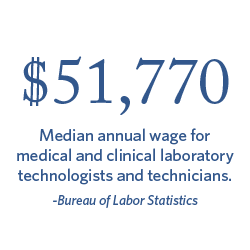 Pursue employment as a medical technician or lab assistant.